Lima offers tourists varied attractions, including wonderful restaurants and several picturesque neighbourhoods to explore. There's the historic Old Town, the bohemian resort district of Barranco, and the fun nightlife centre of Miraflores. 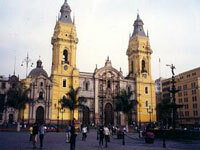 The best place to start sightseeing in Lima is the historic and touristic heart of the city, the Plaza Mayor and Plaza San Martin: two squares lined with colonial buildings, museums, stalls, artists, and buskers, connected by a long pedestrian street. Lima has a number of spectacular churches, but if you only visit one make it the magnificent Baroque Church of San Francisco, which has a richly decorated interior, an impressive library, and intriguing catacombs which can be explored on guided tours. 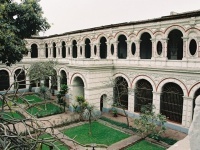 Three of the best museums in Lima are the Museo de Oro del Peru, which displays a wondrous collection of ancient gold artefacts, the Museo Rafael Larco Herrera, the most popular museum with tourists, and the Museo de la Nacion, which is rundown but still contains some impressive artefacts. If you are travelling in Lima with kids be sure to visit the Magical Water Circuit (Circuito Magico del Agua), a stunning display of light and water in the Reserve Park, which will delight children and has become one of Lima's most popular attractions. Lima has been declared the 'Gastronomy Capital of the Americas' and it is an extremely rewarding destination for foodies. 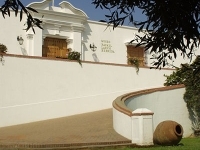 The city is full of restaurants catering to every taste and budget and there are many international cuisines on offer, although the local Peruvian fare is unsurpassed. When choosing restaurants, look out for the 'Restaurante Saludable' logo, which is awarded to eateries for cleanliness and good health standards.